The CowaRobot R1 is an autonomous suitcase that follows you around, sans human effort. A smart bracelet lets you summon the suitcase, and a mobile app helps you track its whereabouts. Even those who really enjoy travel will admit that lugging baggage around is far from fun. 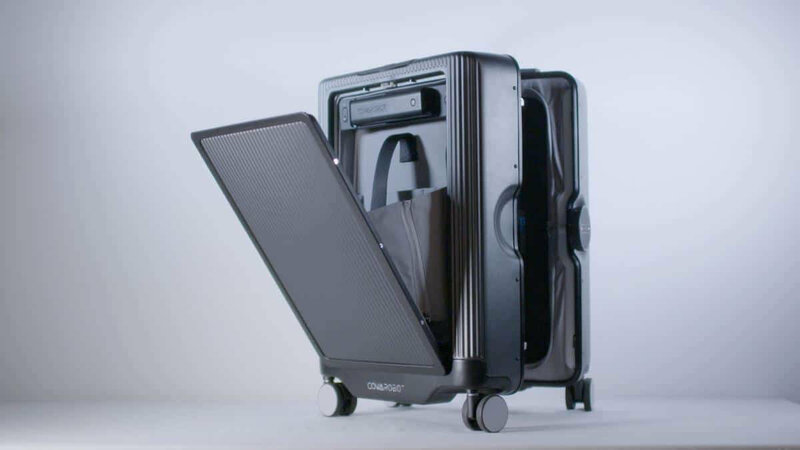 If only there was some way to get around without having to constantly worry about carrying, pulling and monitoring your bag…Well now there is: a smart suitcase. The CowaRobot R1 is an autonomous robotic suitcase that follows you around everywhere you go—like the luggage equivalent of R2D2—as long as you’re wearing the bracelet that lets it know where its owner is. The clever carry-on will keep apace at a 4.5 mpr maximum, which is sufficient considering the average walking speed is 2.7 miles per hour. What gives the CowaRobot R1 its navigational capabilities is what its makers call “CO-EYE.” It’s a fancy term for the patented depth sensor technology built into the suitcase. Also on board are cliff detection sensors—so the suitcase doesn’t fall off stairs or edges—and sonar. These sensors combine to help the smart suitcase “see” the world around it and decide on the best path forward. And if you’d like to turn off all the cool features for a while, you can touch the handle and the suitcase goes into Manual Mode instantly. Apart from establishing who the owner is, the bracelet also serves as a keyless remote for the CowaRobot. Double-tapping it signals to the suitcase that it needs to plan a path back to its owner. If you’re beyond the 164 feet “safe distance” from the carry-on, the bracelet will vibrate to let you know that either you or the suitcase has strayed off (it was probably you). If it happens to be misplaced, you can track its whereabouts using the accompanying mobile app. The app can also be used to share your travel plans, check on the battery levels of the suitcase, and to control another one of the suitcase’s smart features: the intelligent lock system. The “CO-SMART” locks that keep the CowaRobot R1’s payloads safe combine the features that you’d expect from such a smart device with traditional baggage security. The lock can only be opened by a custodian of the bracelet; built-in LED lights change colors to indicate whether the suitcase is open or locked. There is also a combination lock built in to ensure that it complies with TSA security standards. The CowaRobot R1 uses a 96.5 Wh lithium-ion power bank to fuel its components. 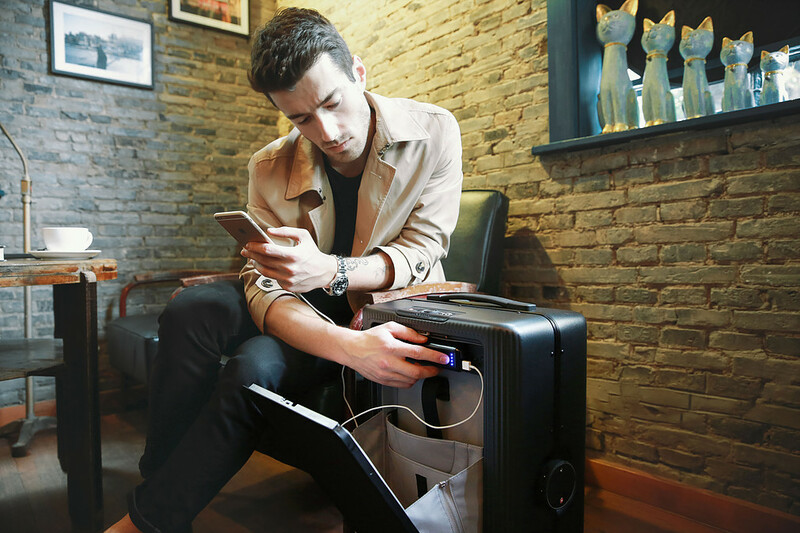 The same power bank can be used to charge your devices using the USB ports built into the suitcase. The battery can go more than 12 hours on a single charge, though that may vary depending on whether it’s being used to charge other devices. It’s also removable, so you don’t have to worry about setting off alarms everywhere you go. Despite all the sensors and other components packed in this smart suitcase, it’s as spacious and effective as a regular carry-on bag. Its frame is built out of aluminum, and the entire piece has a capacity of 33 litres. A modular design is used to pack in all the electronics, which take up just 4 percent of the total volume. The remaining volume—laid out over the 20-inch body—accommodates the “dual-access cabin.” This allows you to easily remove the portion containing all your electronic devices at airport checkpoints. No more repacking after security checks. Awesome. The CowaRobot is part of a new breed of travel accessories, and it already has some stiff competition. NUA Robotics has a similar smart suitcase in the works, with a camera sensor and Bluetooth to help the suitcase identify and follow its rightful owner. NUA showed off its creation at CES this year, but has yet to make the product available to the mass market. The CowaRobot R1 is being offered via IndieGogo; the campaign has raised almost $250,000 with about 3 weeks to go. Early bird units have sold out, but you can still book a unit of the autonomous suitcase for $449, which is 36 percent off the expected retail price. Deliveries are expected to commence as early as November, 2016. Give it some teeth and a self-defence app and it’s The Luggage! Show me this thing looking just like R2D2 and we have a deal! it’s a carry-on. this is mentioned multiple times in the article. This is carry on luggage so you take it with you on the plane. You don’t check it in and leave it in the hands of airport staff. That’s why they mention security checks and a compartment for electronics that you can remove too. It looks pretty tough. How tough of a suitcase do you need? I guess that depends on what you are transporting, right? I’ll definitely buy one if possible.